These Farm Heroes level 121 cheats and tips will help you beat level 121 of Farm Heroes. 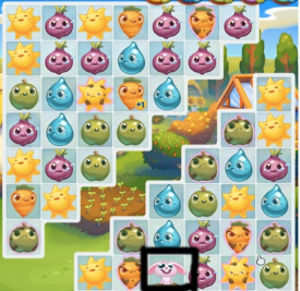 The objective of Farm Heroes level 121 is to collect 30 carrots, 30 apples, and 30 suns in 28 moves. 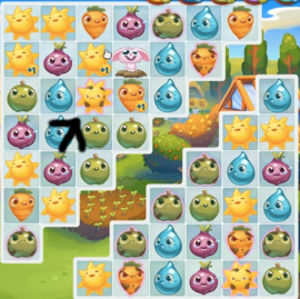 Watch out for the dreaded rabbit in Farm Heroes Saga Level 121. He will come out of nowhere and at anytime and devour your precious cropsies, and force you to use to many boosters. To knock him out for a couple of moves simply make a match near him. Level 121 Cheat #2: And the grumpies! This level is absolutely loaded with grumpies, so be on the look out for them. Remember, making matches with them count as nothing. This means you should avoid them at all cost since the will serve you no good. But you have 28 moves, so if you need to move them to create a larger and much needed match, then do it. 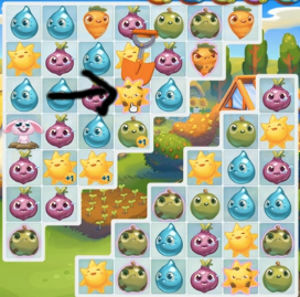 The shovel is also a great booster for level 121.The shovel will help you remove certain items that are in your way. Use the shovel to remove a crop or item that is preventing you from making a big match. For instance they are going to work great against the rabbit and any grumpy cropsie in your path. Remember to use them as best as possible. Using the shovel will help save your moves since using this booster does not use up any moves.